High fees, large incumbents, and a $400B+ market are under attack by a slew of remittance startups. Here are 13 to watch. Western Union, the titan of the “cross-border money transfer” market, with a ~15% worldwide market share, is being challenged by multiple well-capitalized upstart companies targeting the $436B remittance market. These new companies are aiming to get a piece of the fees that companies like Western Union and MoneyGram charge. Reports estimate that these changes could save developing countries as much as $16B/year. 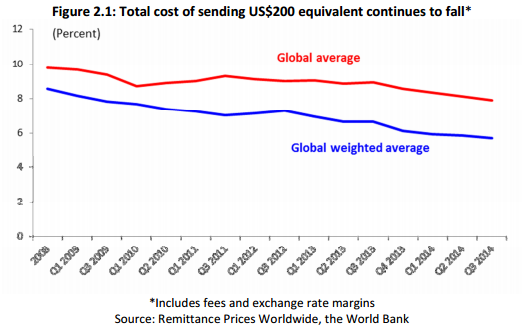 There has been pressure on their fees for some time as the graph below shows the decline of global average costs associated with sending $200 internationally from 2008 to Q3’14. Specifically, the global average has fallen from ~10% of the transaction to 7.9% in Q3’14, while the average weighted by the size of the bilateral remittance flows has fallen from ~8.5% to 5.7% in Q3’14. A 123-page report covering VC funding trends for fintech and the developments in large categories such as wealth management, blockchain, remittance tech, and insurance tech. Below we’ve compiled a list of 12 startups going after the incumbents in the remittance space. Some, like BitPesa and ZipZap, are among those looking to leverage bitcoin as a potential solution to this problem. Others, like London-based WorldRemit, have raised over $100M in funding and are using digital payments paired with the increasing penetration of mobile devices in developing countries to lower fees and make remittances more financially accessible worldwide. Want to track the startups attacking Western Union?? Login to CB Insights or sign up for free below.